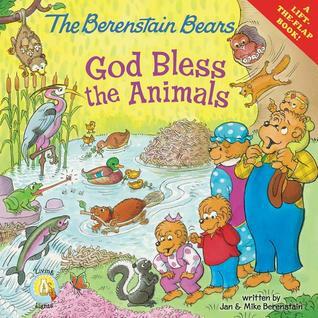 With the 50th anniversary of the Berenstain Bears underway, it is a blessing to see the legacy continue as new books are added to the beautiful ones already created! This Lift the Flap book is perfect for toddlers. Simple wording, as the Bear Family takes a nature walk to see all of the animals God has given in their little corner of Bear Country. They meet many animal friends on their nature walk like the rabbit, skunk, possom, heron, a beaver and more. With one lift the flap per page, the child can guess what may be hiding behind the stump, grass, or cabbage patch. Full of beautiful illustrations of God's creation, this book is one to be read over and over. My 4 year old takes it from one person to another to re-read it to him throughout the day. I can easily see it becoming one of his favorites! Published by Zonderkidz, the Living Light Berenstain Bear books help children learn how God wants them to live each day. I have been surfing online more than 3 hours these days, yet I by no means found any attention-grabbing article like yours. It is beautiful value enough for me. In my opinion, if all web owners and bloggers made good content as you did, the web will probably be a lot more useful than ever before. Lilla Rose Flexi Clip Giveaway 2 winners! Goose Creek Candle Company Giveaway! Current Giveaways on Jubilee Reviews!! Princess Grace and Poppy I can Read! Sparklebee's Sanrio with Paul Frank Giveaway!